Happy Thursday everyone! Robin here with my weekly design for Dies R Us, your online super store! I am amazed by all the background dies we have to choose from. This die does it all! 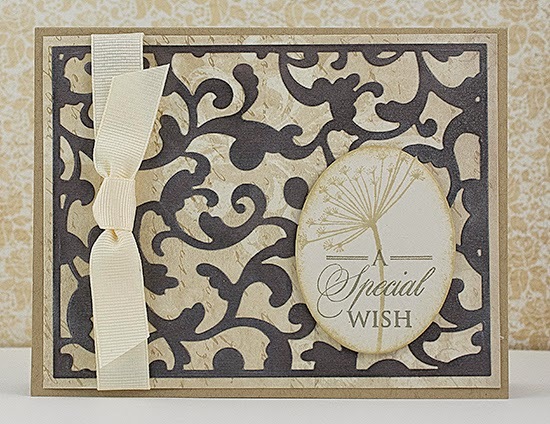 No need to embellish or add much to finish this elegant card! The Elliana Background die, from Memory Box was cut from a dark brown CS and then lightly sprayed with Pewter Perfect Pearls. I glued the die cut to a complimentary piece of printed paper, attached a simple grosgrain ribbon and adhered to my kraft paper card base. 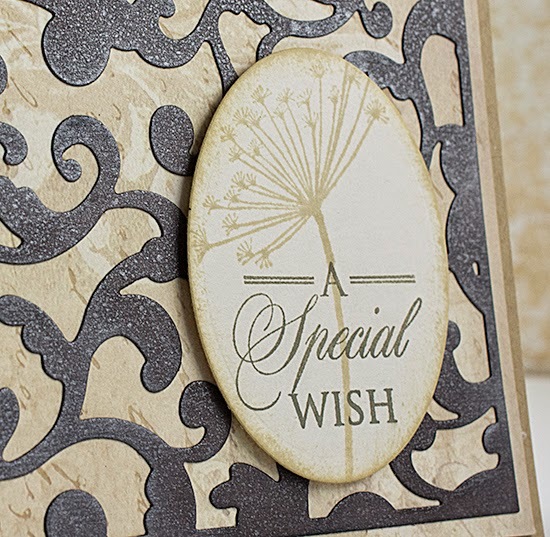 A simple floral element was stamped along with my sentiment, A Special Wish and then both were cut out using Spellbinders Classic Ovals. I can see using the Elliana die for so many occasions; it would be beautiful for a white on white project! Please check out our challenge blog, we have two challenges a month with different themes. The theme for this month, challenge two, is Stitching. Don't be left out, send us an image of your card that uses dies and stitching, you could be one of our monthly winners! This is just stunning! I agree with you, it is so elegant it doesn't need anything else to complete it! Super job, Robin! Gather Summer While You Can! A Dies R Us ... Merry Christmas! Happy Birthday My Brave Leo! A day in the life of a cat . . .